Are you willing and eager to try something new in life? Why not try some unique & interesting Japanese candy and snacks? Over here at the Give It A Whirl Girl blog we are all about trying out new and unique foods and the Japanese candy and snacks fit right in perfectly! 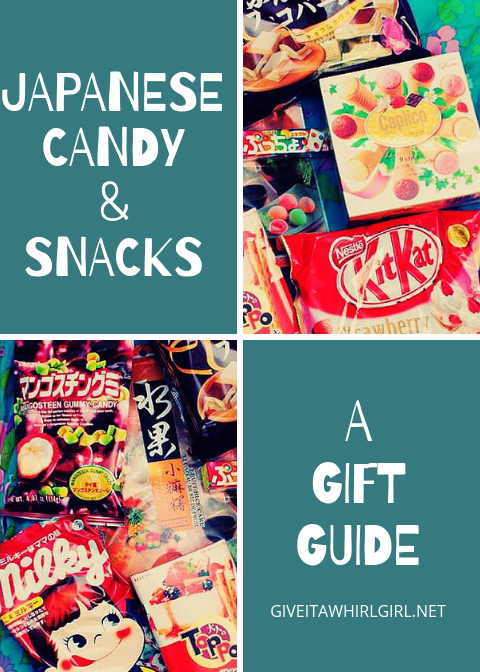 There is a very wide assortment of Japanese candy and snacks in this gift guide and there is something for everyone. Many of these Japanese candies come in some unusual flavors, such as lychee flavor and milk flavor. I am always trying to encourage others to eat with an open mind. My intent behind this list is to open you up to some new and exciting flavors and foods. Do you know what the word KAWAII means? In Japanese, the word kawaii means cute. Everything here on this gift guide ventures into the realm of cuteness! These candies would be perfect for gift giving to a child or an adult who is young at heart. The packaging on all of these Japanese candies and snacks are adorable, creative, colorful, and interesting to look at. These products are all available on Amazon and they include free 2-day shipping if you are an Amazon Prime member. If you are not yet a Prime member be sure to sign up for a free 30-day trial. This free trial will definitely come in handy for all of your holiday shopping this year. This is a fabulous assortment box to help kick off this list here! This is $30.00 on Amazon (at the time of publication) and it ships free with Amazon Prime. This variety pack contains 15 premium pieces of Japanese candy and snacks. This assortment is perfect for gift giving as well if you are looking to give someone a memorable gift. Ramune is a popular Japanese drink that has a marble inside of it! No kidding! Don’t worry though, you are not going to choke on the marble. The marble is trapped inside. Leave it to the Japanese to come up with such a fun and innovative drink! Mad props to them! This variety pack of Japanese Ramune soda includes 8 fun flavors to delight your palate. It includes pineapple, coconut, grape, melon, lychee, strawberry, orange, and original flavor. Wowza! Check out this variety pack of Japanese Kit Kat candies. Kit Kat is HUGE in Japan. It saddens me that we do not have these fun flavors in the US, but lucky for us, this is available on Amazon with free 2-day Prime shipping. This is also super excellent for gift-giving. I know that if I ever received this variety pack it would make for one hell of a memorable gift and I would savor each and every bite. Ahhh yes! Pocky! This is a Japanese candy that you are definitely going to want to try. Pocky are little biscuit stick snacks that are dipped into various flavors. Pocky Flavors Include: Chocolate, Strawberry, Matcha, Cookies & Cream, Chocolate Banana, Milk Chocolate. Pejoy Flavors Include: Chocolate, Matcha, and Cookies & Cream. Hi-Chew is one of my all-time favorite Japanese candies! These are the flavors that are included in this variety pack: Strawberry, Grape, Green Apple, Mikan, White Soda, Cola, Pineapple, Lemon Squash. If you like candies that have a chewy texture then you will absolutely love Hi-Chew candies. Milk candies are another candy fad in Japan and for good reason! These are delicious and have a delightful creamy taste. These Milky candies have the sweet taste of honey combined with yogurt and added collagen. Here we have another great vareity pack of Japanese candy and snacks. You will receive a minimum of 10 snacks with this box. I believe this a random snack pack so what you receive may vary from the image. Each Item in this Box is guaranteed to be made in an Asian country to give you a truly authentic tasting experience! Japanese candy makers often produce little DIY kits so you can create your own Japanese candy. These are fun little kits and would be a great project to do with your child. However, the instructions are often only provided in Japanese. There are usually illustrations to help guide you on what the steps are to create your own candy at home. Glico Caplico is one of my favorite Japanese candies! These are miniature ice-cream cones. These are light and airy treats and come in three flavors: strawberry, chocolate, and vanilla. Last but not least on this Japanese candy and snack gift-guide is a 20 count variety pack care package chock full of Japanese sweets and treats! This is currently selling for $26.50 and ships free with Prime. That comes out to only being a little more than one-dollar per candy/snack! This is a great deal and way too good to pass up! The actual contents that you will receive may vary from what is shown in the photo, but that is perfectly fine. I am all about the element of surprise and receiving some random snacks would be a-okay with me! So be adventurous and go ahead and treat yourself to some kawaii sweets! What is your favorite Japanese candy or snack from this gift guide? Leave me a comment and let me know. Be sure to check out Kawaii Bubble Tea for a unique boba drink! They are located in Clinton Township, MI. 25% OFF Site Wide at DylansCandyBar.com! FREE Shipping on $25+, too. Use code BLACK2018 to save 11/24 + 11/25 only. This entry was posted in Shopping Guide and tagged amazon, candy, cheeesburger, Christmas, diy, drink, gift, gift guide, Glico Caplico, Hi-Chew, ice cream, Japanese, Japanese candy, Japanese drink, Japanese snack, kawaii, kit, Kit Kat, milk, Pocky, Popin Cookin, Ramune, shopping, shopping guide, snack, soda, stocking stuffer, variety pack. Bookmark the permalink. I love Japanese candy! It’s all so fun and colorful!! (Japanese Candy & Snacks – Kawaii Sweets Gift Guide) These japanese candy are so neat. My husband and I got our daughter one for her birthday a couple of years ago and she loved it! Thanks and I am glad you enjoyed it. I love the mixed boxes! Perfect for someone like me who wants to try everything!! They are cool. I am getting my daughter one for her birthday.